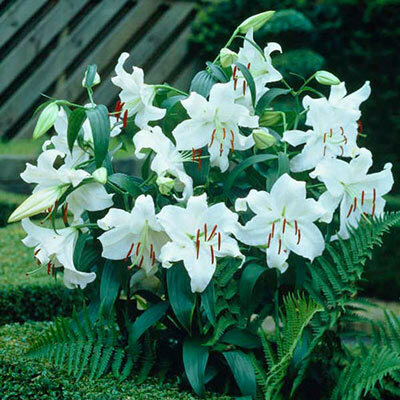 It's easy to see why the Casa Blanca Oriental Lily is often used by florists and is a wedding favorite. Its dazzling, fragrant 10" blooms are perfect for bridal bouquets and fresh flower arrangements. In the garden, the blooms appear to glow in the moonlight—and they attract butterflies. Delicate and fragrant, Oriental lilies are some of the most beautiful lilies available. Their fragrance permeates the summer breeze. Plus, they are easy to grow, delivering spectacular blooms year after year. They bloom later in the season than many other lilies. Hardy bulbs can be left in the ground year-round for increased beauty in following years. Bulb size: 14-16 cm.